The back of the document reads in Russian and French: “Перевыборы в Петросовет на Путил. Заводе после доклада тов. Глебова. Путиловского. Июль 1920” – “Nouvelles élections au Petrosoviet à l’usine Poutilov” – [“New elections to the Petrosoviet at the Putilov plant”]. The banners read in Russian: “Да здравствуетъ праздникъ Всемiрной Армiи Труда”; “Починить один паровоз значит приблизить конец голода и нищеты, этим добить окончательно капитализьм” – [“Long live the holiday of the Global Army of Labor!”; “To repair one locomotive is to bring closer the end of hunger and poverty, and by this means finish off capitalism for good”]. Black and white photograph; 11 x 15 cm. 1This photo shows us some of the political and social dynamics of Petrograd itself around the time of the Second Comintern Congress in July 1920 or slightly earlier. 2Looking at us are the workers of the Putilov factory: mainly men with their worker caps, but also a number of women with their head scarves. They are conducting elections to the Petrograd Soviet, the local government body whose chairman was Grigorii Zinoviev. For the most part, elections in Soviet Russia were by this time single-party affairs, although the other socialist parties had not yet been definitively declared illegal. Nevertheless, the election process was still an important means of communication between the ruling party and its worker base. The annotation tells us that “Com. Glebov” has given a report; this may be the prominent Bolshevik Nikolai Glebov-Avilov who was a trade-union leader in Petrograd and who, until recently, had been People’s Commissar for Posts and Telegraphs. He is distinguished from the workers by his tie and suit jacket, but his suit is hardly elegant and he seems at ease in this environment. 3On the left, the poster reads “Long live the holiday of the Global Army of Labor!” A worker is shown ringing a holiday bell. This poster may have been put up during May Day celebrations or it may be referring to the Comintern Congress. On the right is a slogan which brings out the grim economic realities of 1920: “To repair one locomotive is to bring closer the end of hunger and poverty, and by this means finish off capitalism for good.” The immediate goal is to stave off complete economic collapse by alleviating the transport breakdown. Yet even this struggle with immediate “hunger and poverty” takes on meaning because of the long-term perspective of finishing off capitalism. Thomas F. Remington, Building Socialism in Bolshevik Russia: Ideology and Industrial Organization 1917–1931, Pittsburgh: Pittsbugh Univesity Press, 1984. LIH, Lars. Workers’ Meeting, Putilov Factory, Petrograd, 1920 In : From Communism to Anti-Communism : Photographs from the Boris Souvarine Collection at the Graduate Institute, Geneva [en ligne]. Geneva : Graduate Institute Publications, 2016 (généré le 22 avril 2019). Disponible sur Internet : <http://books.openedition.org/iheid/6602>. ISBN : 9782940503971. DOI : 10.4000/books.iheid.6602. Lih, Lars. 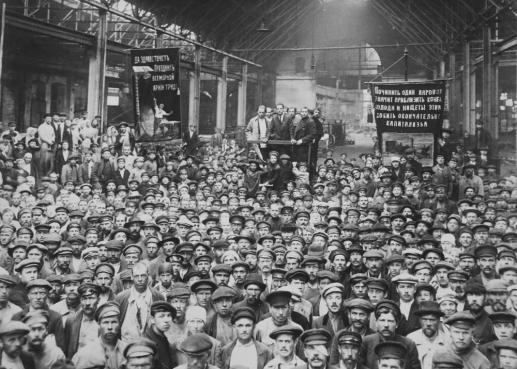 “Workers’ Meeting, Putilov Factory, Petrograd, 1920”. Liebich, Andre, et Svetlana Yakimovich. 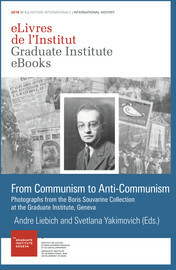 From Communism to Anti-Communism : Photographs from the Boris Souvarine Collection at the Graduate Institute, Geneva. Geneva : Graduate Institute Publications, 2016. Web. <http://books.openedition.org/iheid/6602>. LIEBICH, Andre (dir.) ; YAKIMOVICH, Svetlana (dir.). From Communism to Anti-Communism : Photographs from the Boris Souvarine Collection at the Graduate Institute, Geneva. Nouvelle édition [en ligne]. Geneva : Graduate Institute Publications, 2016 (généré le 22 avril 2019). Disponible sur Internet : <http://books.openedition.org/iheid/6440>. ISBN : 9782940503971. DOI : 10.4000/books.iheid.6440.